Normal locking (press once; fixed lighting of the direction indicators). Deadlocking the vehicle (press twice in succession; fixed lighting of the direction indicators). 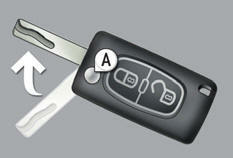 Complete or selective unlocking of the vehicle (rapid flashing of the direction indicators).